Bethesda-based Finmarc Management Inc., which bought the property in 2005 with plans for a shopping development, announced the deal Tuesday. 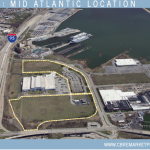 The buyer was identified as 2701 Port Covington Drive LLC, an entity created this month and represented by law firm Ballard Spahr LLP, according to state records. A partner at the firm declined comment. 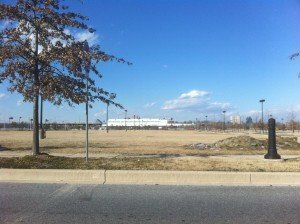 The condition of the shopping center, which includes a Walmart and an out-of-business Sam’s Club, has long been a source of frustration for the community and is the subject of the most read article in the history of SouthBMore.com. 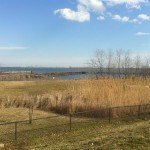 In 2000, the land was sold to Starwood Certuzi of Connecticut, a commercial real estate company that planned a $50 million big box store development. However, they were unable to get the visible signage and road accessibility they desired, and all of the stores, other than Walmart and Sam’s Club, pulled out. Sam’s Club later closed their doors in 2007. A casino was also potentially eyed for the development in the early stages of planning, but by the time Maryland’s gaming laws passed in 2007, the development had already fallen apart. Finmarc Management Inc. and Kodiak Properties, both out of Bethesda, took over the property in 2005. 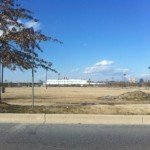 SouthBMore.com will keep a close eye on this news as many ideas were floated around for the large parcel in the past including a Seacrets Resort, a new horse racing complex, a soccer stadium and training complex, and an arena. 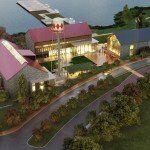 SouthBMore.com also offered some ideas and put it up for discussion in this article. An adjacent parcel, once owned and eyed for redevelopment by Streuver Bros., was auctioned to a new buyer in the fall of 2012. Landscaping work was recently done on the property, a fence was installed, and environmental testing has been underway.